Join us for another community celebration and charity event in support of the Cascade Aids Project, MC’ed by the fabulous Madame Dumore! This 420 we’re bringing you our first ever Karaoke Cook-off and it’s going to be smok’n! We’ve invited some of St Johns’ tastiest eateries to serve up their best dish in a friendly cook-off competition and we need YOUR HELP to crown the “best” dish in St Johns! Madame Dumore and ChelseaYeahwill be our guest judges! A $5 donation to support the Cascade Aids Project is greatly appreciated, but not required to participate. 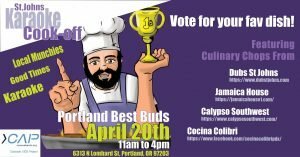 So stop by, taste the local goodness, and cast your vote. Don’t forget to bring your best back-up dancers because we’ll also have Karaoke! We know Portland’s got talent, so show us what you can do! We’ll have music, a raffle, vendors, swag, live-art painting that you can join, and of course good times for all! For our 21+ guests, there will be 420 specials running in the shop all day! We hope you’ll stop by, show your support for the Cascade Aids Project and our wonderful St Johns businesses. See you there!